Take a look at the upcoming events at Saskatoon Wine Spirits Beer. There’s vegan wine and food (from Gud Eats) on Sept. 28, Belgian beers on Oct. 6, and Pinot Noir – the Heartbreak Grape on Nov. 2. The Local Kitchen has posted its October cooking class schedule with everything from pumpkin and gnocchi to Italian and Asian flavours. September classes are nearly sold out so sign up soon if you’re interested. Celebrate Saskatchewan’s seabuckthorn harvest at Seabuckthorn Days, Sept. 15-16. There will be a talk by Dr. Raju Soolanayakanahally on the evaluation and development of new trees and shrubs, a gourmet luncheon, and lots more fun. I’m intrigued by the concept behind Revolve Café. It’s a collective giving food entrepreneurs an opportunity to offer their product to the public without the financial risk of opening their own storefront. Food entrepreneurs make their product in the café kitchen and Revolve takes care of marketing and selling it. So far there is a coffee shop, poke, and doughnuts, but they’re open to helping other people kickstart their business. I was pleased to see Nicole Davis being given an opportunity to explain why Daybreak Mill is organic. However, I tend to agree with comments on Twitter that noted how differently the farmers speaking for and against pesticide use were presented. The male farmer who speaks in favour of using pesticides is presented as having a degree, a family, and industry experience. They present next to no information about Nicole – the fact that she comes from a farming background and worked closely with Alvin Scheresky, one of the first organic farmers in North America to have production facilities on his farm, or that the farm has been organic since 1890. I enjoyed a walk at Nelson, BC’s Lakeside Park last week and posted a few photographs. Nelson’s Lakeside Park is lovely, even under smoke-filled skies. It’s a much better place to while away a couple of hours than by heading to the mall next door. Black Fox Farm & Distillery is hosting G & T Nights. The next one is from 6:30-8:30 pm, Aug. 22, with music in the flower fields, gin & tonic, and a new drink they’ve concocted in collaboration with Living Sky Winery. Global Pot Fusion Cuisine is hosting a pop-up restaurant at the Saskatoon Farmers’ Market from 11 am-3 pm, Aug. 25. Slow Food Saskatoon is planning a 100% vegetarian and vegan-friendly harvest supper at Black Fox Distillery from 5:30-8:30 pm, Sept. 30. Come out and show your support for food that is good, clean, fair, AND vegetarian! September is a really busy month at the Garden Patch. They're looking for volunteers to help harvest thousands of pounds of vegetables. Can you help? Food Not Bombs – Saskatoon meets every Sunday from 2-4 pm at Westside Community Clinic. They share free vegetarian/vegan meals with the hungry and plan to hold movie nights. Here’s something new to taste – apple & cherry cyser from Sentinel Bottleworks who share space with Rosthern Cozy Cottage Bakery. Cyser is apparently a combination of cider and mead and available at the Saskatoon Farmers’ Market. I happened to read about One Drip Café’s reopening. It’s located at Avenue H and 18th Street, and the sandwiches sound yummy. Petrofka Orchard is hosting an AppleFest on Aug. 18 with food, music, a pie eating contest, and activities for kids. Bill Roe will muse on his time as a defence counsel at 7:30 pm, Aug. 21, at 9 Mile Legacy Tap Room. Join a pay-it-forward group of beer-loving ladies at the first Ladies that Beer meet up, at 7 pm, Aug. 23, at Prairie Sun Brewery. If you’re in the mood for something sweet and delicious, head up to Avenue H and pick up some treats from Fable Ice Cream and Darkside Donuts. The line-ups went round the block when The Night Oven Bakery sold doughnuts, so Bryn Rawlyk decided to open a separate store just for doughnuts. Darkside will have some regular flavours, but they also plan to push the limits and try out some “super weird stuff”. Fabulous bread products - and I get to talk French! You have two opportunities in the next few months to improve your food photography skills. Chef Mike McEown (former owner of Prairie Harvest Café) is now an evening chef at Boffins restaurant, Innovation Place. Good luck, Mike! I hope you’re enjoying your new job. If you’re interested in beer and local food production, be sure to read Cathy Engel’s post about Maker’s Malt. Saskatoon chocolatiers: Those Girls at the Market make great chocolate, but I wasn’t familiar with River Layne Chocolate Couture – I’ll definitely be on the lookout for them when I’m back in Saskatoon. A Newcomer from Kenya has opened a pastry shop selling African delicacies under a local label. As people said the mandazi reminded them of bannock, she’s called her store Yvema’s Bannock House. This cake recipe sounds absolutely delicious – a good one to try if you like experimenting with alternate flours and making use of seasonal fruit. In the late 1900s, David Fairchild travelled the world looking for new food crops to introduce in the United States. 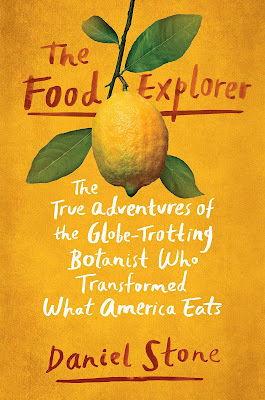 The Food Explorer by Daniel Stone chronicles his journeys but also notes the mixed response he received. Many of the new fruits and vegetables were enthusiastically received, but there was also a backlash, particularly from one scientist who feared that foreign plants would introduce new pests and diseases. The controversy is as relevant today as it was then. Are we optimists or pessimists? Do we welcome what is new (i.e. immigrants and refugees) or do we bar our doors to all outside influences?